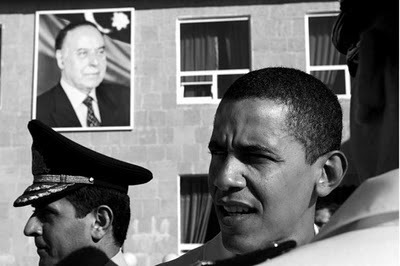 Perhaps not all of you know that the current US President Barack Obama visited Baku when he was a senator. One Azeri blogger wrote that his friend, an employee of the Azerbaijani MFA had almost gone mad for he had lost his photo with Barack Obama. Yes, Obama took a tour of former Soviet Union with Senator Lugar in August 2005, to check the implementation of some agreement between Russia and U.S. regarding nukes. They have been to Russia, Ukraine and Azerbaijan. Here is a comprehensive article about their visit. No, he didn't ask "why do the doctors only make $700 a year," or "why did you guys bash the heads of peaceful demonstrators?" He asked, "why aren't there more McDonald's?" Well, we know why state employees are paid so low and why the cops are so brutal, but the question remains, why is there only one McDonald's in Azerbaijan? survey: a) because Armenia has none. b) because nobody outside of downtown Baku can afford a cheeseburger. c) because there is no McMutton on the menu. Ah, I recall all that talks about Barack Obama's McDonald's murmur in Baku! Some of my friends were outraged when they heard that Obama nominated himself for the President - look at this guy, when he was in Baku, he was lobbying for McDonald's! I wouldn't count out that McMutton--though obviously I haven't been to Baku ;)--McDonald's varies its menu depending on the country. For instance, India has no hamburgers. Here's a sampling of alternative fares: http://bit.ly/6LP5AO. And, as a commenter says, in Israel they have the McShwarma, which is lamb. So can we thank Obama for Mc Lavash and 3 additional locations?